When Kenneth Branagh usually directs an adaptation of a notable source, chances are that he’ll stick very closely to the material and/or go for a more traditional route in re-telling it on the big screen. His version of Hamlet, for example, is completely unabridged and presented in all of its glory (even though it runs over four hours), while his adaptation of Mary Shelley’s Frankenstein is widely considered to be one of the most faithful movie versions of Shelley’s novel, and even other ones like Cinderella he adopts a very traditional way of telling that classic fairy tale. Branagh continues both the straightforward and traditional, erm, traditions with his new version of Agatha Christie’s classic mystery thriller Murder on the Orient Express, which once more demonstrates his ability to stick close to the source while also making it a rather handsome film to look at, even if you’re far too familiar with the story on which it’s based. 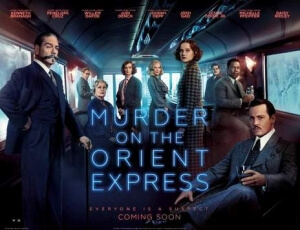 It begins, as does Christie’s novel, when famed Belgian detective Hercule Poirot (played by Branagh with some rather exquisite facial hair) boards the Orient Express train in Istanbul towards Calais, after he is summoned to London after a case. On board, he encounters several of the passengers including the rather slimy American Samuel Ratchett (Johnny Depp), who tries to recruit Poirot into protecting him from certain enemies that want to kill him, but is refused. The next morning, however, Ratchett is found dead in his compartment, stabbed twelve times in the chest despite a locked door, and while the train is stopped due to heavy snow Poirot goes around the carriage interviewing all of the remaining passengers, who are deemed suspects in this most mysterious of cases, and tries to sort out who the killer is among them. Branagh has gathered a true A-list cast for this film; aside from himself and Depp, he’s gotten actors like Penélope Cruz, Michelle Pfeiffer, Josh Gad, Derek Jacobi, Daisy Ridley, Judi Dench and a few others to play major roles here, and in the short amount of time they each have on-screen they make the most of it, and in some cases they even deliver some of their best work (up until now, you probably wouldn’t have imagine that Josh Gad could actually act, but this movie contains the proof). However, it is Branagh who stands out the most, and that’s not even mentioning his luxuriant moustache; his Poirot, a character portrayed over the years by the likes of Peter Ustinov and Albert Finney among others, is a highly entertaining person to watch as he’s either solving the case or just chilling with other people, and not even his meandering Belgian accent can distract from how much fun he can be at just doing what he does best. Behind the camera, Branagh delivers a mostly solid movie that definitely tells this famous prose in the most straightforward of ways, but regardless of whether or not you know the big twist of this story it’s a fun ride just getting to that point where the truth comes out. As you’re watching these several characters be interviewed, their personal connections to the victim become more and more apparent, and it’s really interesting to see it all be revealed to you in a pretty entertaining way, though for fans of the book I imagine it’s easy to get pretty bored with it rather quick because they know more about it than others do. For those that aren’t too familiar with Christie’s story, however, it’s cool to be introduced to this story in this way, and have it be done in a well-acted and well-made (for the most part, anyway; there are a few noticeably bad CGI shots of the train exterior) manner that it makes you want to read the book immediately after you see it. It can, however, be a bit slow in parts, and having it mostly confined to just the one carriage does limit its cinematic possibilities – there are only so many times you can have characters interact in train compartments before you’re pining for somewhere a bit more open-spaced – and again, to those that are more familiar with the book it’s likely you’ll just dismiss this as yet another dull adaptation. But for those who aren’t as fortunate, it’s a fine introduction to the story and to Agatha Christie’s most famous character, who will hopefully show up in more feature adaptations in the near future, but only if Branagh and that gorgeous moustache plays him. Murder on the Orient Express is a straightforward and traditional adaptation of Agatha Christie’s famous novel, given a jolt of life by Branagh’s handsome filmmaking and entertaining portrayal of Poirot, but while it may win over some unfamiliar audiences it could potentially bore those more familiar with the text.